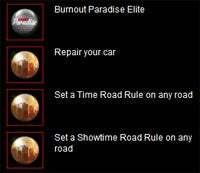 Burnout Paradise saves are locked to your profile. We had hoped to use this to retroactively award trophies, but we discovered during testing that this is not possible. You will therefore require a fresh game-save to receive trophies in Burnout Paradise. If you're familiar with PS3 trophies already, you'll recognise that this works in the same way as all other games that have added trophy support post-release.